Judging by the good number of positive comments I have received both online and offline, it looks like the first of the series of blog posts on My Top 5 iPad Apps of the Week has been somewhat helpful to a good number of folks. So, like I have mentioned on the initial blog entry, here I am, once again, wanting to share on this blog the top picks for Week #2. Twitter for iPad: Last week I mentioned how my all time favourite Twitter client on the iPad is Osfoora HD; this week, it looks like we have got a pretty decent rival in the shape of Twitter for iPad, the official Twitter client that has put together some pretty nifty features that would surely bring you a new Twitter experience on a mobile device. Now, I will still continue to make use of Osfoora HD, but you cannot deny one of the biggest advantages from this Twitter client: it is free! Worth a try, for sure! MindNode: Like I have mentioned in the past, I have been a big fan of mindmapping for several years now and time and time again, whenever there is a new mindmap app out there worth while having a look into I just can’t resist the temptation. Check MindNode. One of those mindmapping applications for the iPad that surely is quite interesting and worth while having a look into, more than anything else, because, if you have got MindNode Pro installed in your Mac, there is a full, and rather nifty, integration between the iPad and Mac apps, so you can take your newly created mindmaps where you would you would to. Pretty neat, don’t you think? GoodReader for iPad: There are quite a few file sharing apps available for the iPad, but if I would have to pick one that I enjoy quite a bit, I think that one would be GoodReader. One of the reasons why I have been accumulating a good number of PDF files, and other file formats is because I now have a lovely way of interacting with them through GoodReader, no matter how large they are. There is one other app I enjoy quite a bit (That I will probably talk about in another blog post from the series), but I think this one will make it into the top list of essential ones to get without any doubt. Another must-have. And that’s it, folks! That’s My Top 5 iPad Apps of the Week for Week #2. Hope you have enjoyed the post and stay tuned for next week’s where I will be sharing the next round! Thanks for the iPad tips. Just got the Twitter app, looks cool and I am already using it. Read your 10 reasons for the iPad. Well, they could be mine too. Although I have top 20 for reasons. Being also a photographer, the iPad is an absolute must-have. Just showing my portfolio on my iPad gets me assignments. 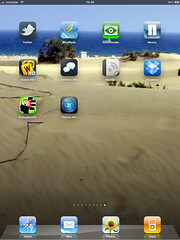 Keep up with your iPad tips, I will gladly check them out.